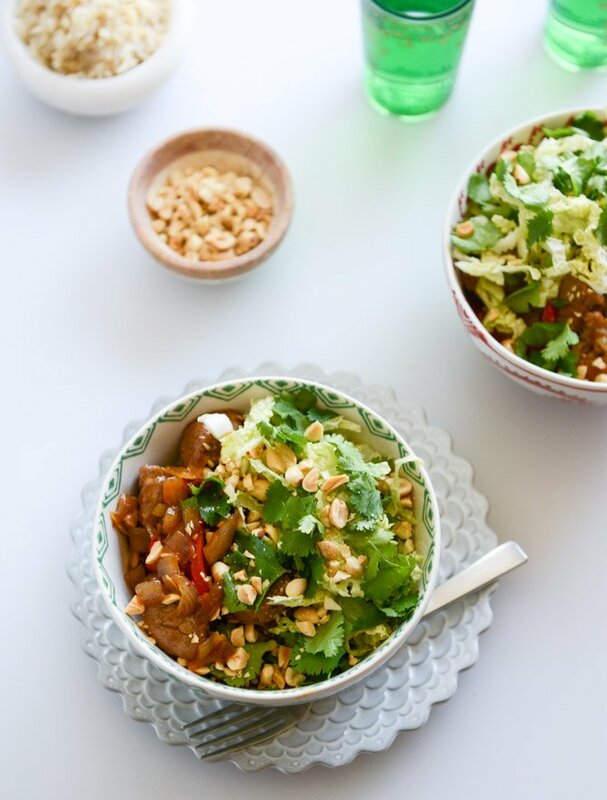 30-Minute Vietnamese Caramel Pork Stir Fry. I want to dive inside and eat my way out. We are talking caramel – like semi-legit, sort of half-assed caramel (think lots of brown sugar and flavor) AND pork. Oh hello two favorite things. I can pretty much die happy. Remember that week when I sort of binged on pork recipes? That was this week. It was a good week but a week I will have to tell you about in the near future because it’s sort of hilarious. And pork filled. I spent a lot of time in the car. I also binged on Mean Girls last night and please tell me that you did too. In honor of their tenth anniversary. I just have a lot of feelings. And still totally flinch when Regina gets hit by the bus. So If there was ever a meal that I could eat everyday forever and ever (or, er, for at least the next two weeks until I find my next favorite – so basic), this would be it. I spied it in a recent issue of Cooking Light and totally died. And then I made it almost immediately because I was still all #omgcaramelpork in my head and couldn’t stop thinking about it. It’s just so freaking fantastic. I KNOW. Broken record. I can’t stop. 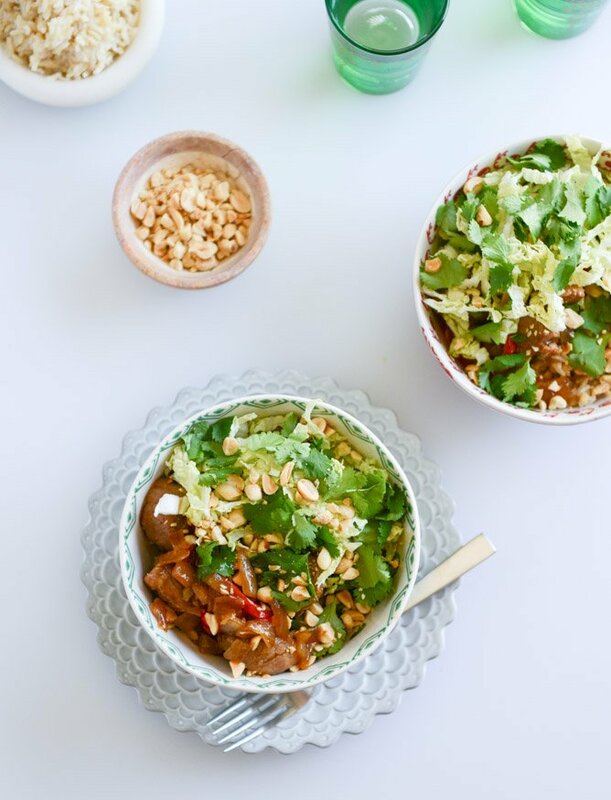 The pork tenderloin cooks quickly (whereas I’m used to destroying pork tenderloins in the oven after waiting for an hour and 25 minutes), the sauce is delicious and the toppings are even better: my favorite napa cabbage, peanuts, tons of cilantro and lime. Cilantro haters, don’t punch me. This isn’t a pork soap bowl. Leave it out if you aren’t into it! It will take you less than 30 minutes. Make some brown jasmine rice – you can do it beforehand too because that stuff is so super high maintenance. Things I am terrible at: cooking rice. Things I have had two of and never used and then gave away: rice cookers. Thing I will probably buy on amazon in three seconds: rice cooker. I feel like my photos don’t even do this justice because seared pork is not that stunning to photograph and, well… I was hungry. Heat a large wok or skillet over high heat. Season the pork with the salt and pepper. Add the oil to the skillet and once it’s hot, add the pork. Cook until seared and golden brown on all sides, about 6 to 8 minutes. Remove the pork from the wok and place it aside in a bowl. Add the onion, ginger and garlic to the skillet, stirring to toss. Cook until slightly softened, about 5 minutes, stirring occasionally. In a bowl, whisk together the chicken stock, sugar, soy sauce, cornstarch, vinegar and pepper flakes. Pour it into the skillet and bring it to a boil. Reduce to a simmer and cook for 3 to 4 minutes. Add the pork and red pepper into the wok, tossing to coat and cook for another 2 minutes. Serve immediately over brown jasmine rice. Top with the cabbage, peanuts, cilantro and a spritz of lime. April Favorites: Food + Fun. I have to concur about diving in and eating your way out, this was INCREDIBLE!!!! I added a couple of red jalapenos because I like it spicy and I couldn’t stop telling my family how yummy it was throughout the meal. :) And every Asian dish from here on out will include napa cabbage, it added such a nice fresh texture to the dish. Well done, we’ll be eating this a lot! Thank you so much for sharing it. This looks like a variation of my favorite Vietnamese dish- Bun Thit Nuong (Vietnamese Grilled Pork with Vermicelli)..I like the way that you do the caramel sauce- simple and easy. The only way that I would modify this recipe is to use 2 teaspoons of soy sauce and one teaspoon of good Vietnamese fish sauce. Yum. Where does the brown sugar come in to play? Made this tonite….awesome!! It has everything:sweet-salty-fresh-tangy-with a kick! Adding this to regular dinner rotation. The fresh crunchy toppings are so fun, we added cucumber and green onion. Thanks for making me look good! I had this recipe saved foreeever, and finally got to make it last night. So easy and so good…we gobbled it all up. Thank you, lady. This dish was super fantastic. All three of my children loved this meal! My husband has requested that I add this to our regular menu rotation. Thank you! Pingback: 25 Ways To Make Dinner Without The Hassle Of Cleaning Up After - Viral Posts Ninja! Pingback: 25 Recipes That Don't Bring On The Burden Of Doing Dishes Afterwards - Viral Posts Ninja! Pingback: If You Think Cleaning Up is the Worst Part of Cooking, You'll Want to See These 25 Meals - Viral Posts Ninja! Pingback: Skip The Whole Clean Up Thing With These 25 Delicious Recipes - Viral Posts Ninja!